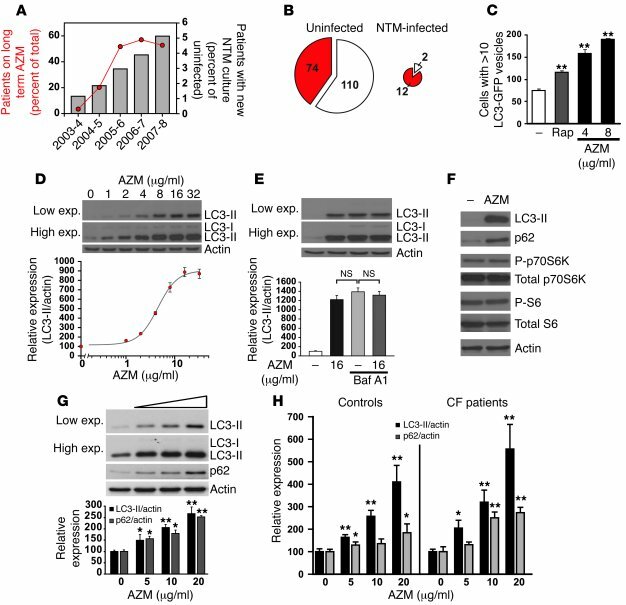 Azithromycin blocks autophagy by impairing autophagic flux. (A) At Papworth Hospital, the numbers of adult CF patients on long-term azithromycin (AZM; red) and with new sputum cultures positive for NTM (gray) rose over the last 5 years. (B) Analysis of the 2007–2008 CF patient cohort. In patients currently or previously infected with NTM, long-term azithromycin use (current or within 6 months of first NTM culture) was significantly more common that in uninfected patients (P = 0.0009; 2-tailed uncorrected χ2). (C) In GFP-LC3+ COS7 cells, 24-hour treatment with azithromycin increased the number of cells containing 10 or more GFP-LC3+ vesicles more so than rapamycin (200 nM). (D) In HeLa cells, azithromycin caused a dose-dependent increase in LC3-II levels (EC50, 4.5 μg/ml). exp., exposure. (E) In the presence of 400 nM BafA1, azithromycin treatment of HeLa cells did not increase LC3-II compared with BafA1 alone. (F) Azithromycin treatment (16 μg/ml) of HeLa cells, while increasing LC3-II, did not alter mTOR-dependent signaling (monitored by changes in phosphorylation of S6 and p70S6 kinase); however, it did increase p62 levels. (G) Azithromycin dose-dependently increased LC3-II and p62 levels in primary human macrophages. (H) Similar effect of azithromycin, assessed by LC3-II and p62 levels, in primary macrophages derived from clinically stable CF patients and healthy controls (n = 3 per group). *P < 0.05; **P < 0.005.